The Solar Eclipse Is Visible in NYC Today (Aug. 21), Starting at 1:23 p.m.
A partial solar eclipse is seen just after sunrise over the Queens borough of New York across the East River on Nov. 3, 2013. This story was updated on Aug. 21. NEW YORK — New York City isn't in the "path of totality," but millions of New Yorkers will be able to see a partial solar eclipse today (Aug. 21) — and it's totally worth checking out, local astrophysicist and science celebrity Neil deGrasse Tyson said in a briefing at the American Museum of Natural History (AMNH). Skywatchers along a narrow path from Oregon to South Carolina will see skies darken during the total solar eclipse. But the rest of the U.S. will still have a pretty cool view of this astronomical event using solar eclipse glasses or some type of pinhole projector. By 2:44 p.m., the moon will block about 72 percent of the sun's surface as the partial eclipse reaches its maximum. Then, the cusps of the crescent-shaped sun will appear to be pointing downward, Joe Rao, FiOS1 meteorologist and Space.com columnist, said during the briefing. After the maximum eclipse, the moon will slowly begin to slide off the sun's face, and the eclipse will end at 4 p.m.
"At mid-eclipse, I turned away and looked about. Everything I saw — the nearby fields, the distant vistas — all seemed wrapped in some strange, unearthly early twilight. The sky seemed darker, shadows sharp and distinct. A cool wind — almost chilly — had sprung up from the West." The partial eclipse over New York on Aug. 21 will have about the same magnitude as Peltier's partial eclipse and should bring a similar experience, Rao said. "If we're lucky enough to have clear weather here in New York at 2:44 next Monday afternoon, I have a feeling that's pretty much what we're going to see in the New York metropolitan area." Rao equated a partial solar eclipse to a flashlight with low batteries. While the light still shines, it's not as bright as a flashlight with full batteries, and the light looks "almost yellowish" in color. "That's kind of like what it will be like next week at the midpoint of the eclipse," he said. "There's going to be a certain amount of yellowness in the air along with that dimming or diminishing twilight for a few minutes around the peak." So, if you're in the city around the peak of the partial eclipse, don't forget to step outside and check it out. Solar eclipse glasses are the best way to see the partial eclipse, and you can still find them in stores around the city. AMNH will provide safe viewing glasses to visitors at the Hayden Planetarium's special event. But if you can't get the glasses in time and can't make it to the museum, Tyson has a great alternative that most New Yorkers can find in their own homes. "Go into your kitchen and get a spaghetti strainer or a colander," Tyson said. "Not with mesh, the kind with holes in it. Go outside and hold that up over the ground. Each one of those holes will act as a pinhole camera and you'll see hundreds of images of the crescent sun on the ground and you can watch the eclipse unfold safely…that's the urban version of watching the pinhole camera images through the modeled light of sunlight passing through the leaves of a tree. It'll just be fun." So if you happen to be near any tree during the partial eclipse, check out their shadows and look for the tiny eclipse projections on the ground. There's really no excuse for missing out on this celestial event, whether you're lucky enough to be in the path of totality, or if only a partial solar eclipse is heading your way. "It won't happen that often in your lifetime that you can walk outside of your own house and watch even a partial happen," Faherty said. 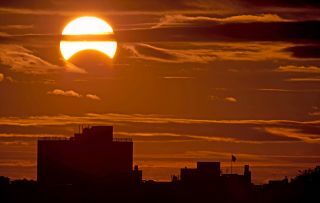 The next time any type of solar eclipse will be visible over New York will be during a partial annular eclipse in 2021.